Tomorrow is the first day of Spring. Finally. Of course that doesn’t mean that it’s magically 75 degrees outside with the sun shining. I think we still have at least one more week of 60′ weather here. And for those of you still getting snow, I’m sorry. Just know that I’m thinking of you. Just because we don’t have Spring weather yet, that doesn’t mean that we can’t enjoy the flowers. Or at least the paper flowers for now. Today’s card uses that gorgeous Springtime Foils paper that is FREE with a qualifying Sale-abration purchase of $50 pre-tax and shipping. This paper comes white with the embossed foil designs, which means you are free to color it whatever color you like. I used my Stampin Blends Calypso Coral and Old Olive to color in a strip of the paper. You can see the color variation in the Blends here because the paper has a slick coating on it, which makes it a little tougher to blend. I kind of like the way it looks because it looks so much like watercolor flowers. The “thinking of you” sentiment is heat embossed using our Copper Embossing powder to match the copper foiling in the paper. I used Basic Black as my card base to help set off the bright colors of the flowers. It really is quite dramatic in person. 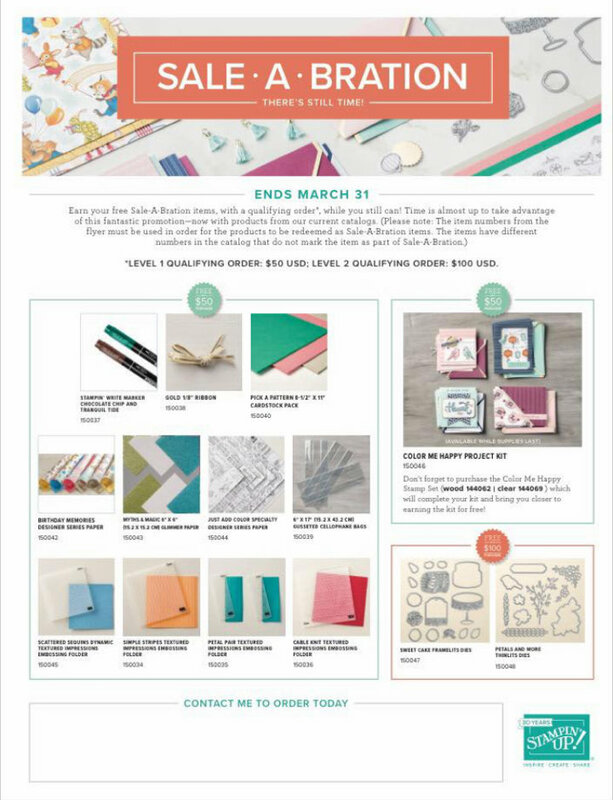 Just when you thought you were done with Sale-abration… Stampin Up releases a bunch of new products that are now eligible to be Sale-abration rewards! These items are in the current catalog for purchase. Or you can select any of the products shown here as your FREE Sale-abration item. Or you can select any of the previously released products as well. So many choices. Sale-abration ends March 31st.